Name It! 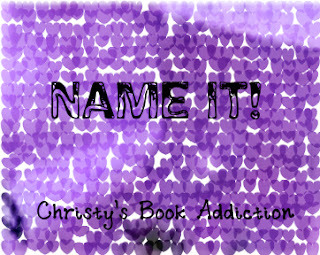 is hosted by Christy over at Christy's Book Addiction. This is how it works Christy is going to come up with a topic and then we will have to choose our answer using our name. If the first word is The, we can use the next word in the title. So here's my response, what's yours? Leave your response in a link in the comments so I can check it out. Make sure you also link back to Christy and leave your link in her comments so we can all check them out. I love The Hunger Games trilogy :D I still need to read Ink and Radiance! Ink was a love/hate relationship I had going with it haha, but I hope you enjoy it! Great picks, and cute idea. New follower.